What “Special Somethings” Would Make Your Kitchen Incredible? Everyone fantasizes about the ultimate “dream” home. It’s fun to flip through design magazines, pin things you like on Pinterest and add your favorite room ideas to your Ideabooks on Houzz. You can see what styles and amenities others like, and share what you find pleasing and useful. The real challenge for a homeowner comes when you decide to remodel or rennovate your space. You begin to think about all the different ideas you have seen and wonder how to implement some of those into your very own updated home. While you may have some ideas and likes that are truly over- the-top extravagant, here are a few suggestions that are very practical. Once you have these amenities, you’ll wonder how you ever lived without them! If you are updating your kitchen, you may want to consider some, if not all, of these items for your new space. Soft-close hinges on cabinets and drawers: This will help save fingers from getting pinched, reduce noise upon closing and help with multi-tasking. Large drawers: If you have limited space for cabinets, install large drawers into lower cabinets. It may be easier to pull open a drawer and see what’s in it, rather than peer into a low, dark cabinet and possibly have to move items around until you find what you’re looking for. Keep your countertop clear: You can install a built-in soap dispenser, eliminating the need to leave out the bottle of soap. Another idea is to build in a microwave with a cabinet door to hide it. If you dine, or like to entertain in your kitchen, create an ambiance by installing dimmer switches to control the lighting for the occassion. Adding under-cabinet lighting can also add charm to your room. 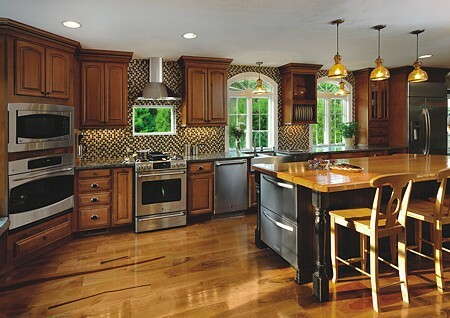 We have some wonderful visuals of lighting in our Kitchen Views Gallery. For more inspiration, take a journey through our gallery to see some of the wonderful work created by our talented kitchen designers.